Reading, UK, 27 September 2017 – Consumers increasingly want to use chat for customer service – but companies are failing to meet their changing expectations. Nearly three quarters (72%) of consumers say a good chat experience will make them more loyal – however only 15% say they are always happy with the service they receive. These are amongst the headline findings of the Eptica 2017 UK Chat Study, released today. The Study, which combined consumer research with a real-world evaluation of chat use by UK brands, also found that consumers are open to using artificial intelligence (AI) powered chatbots, but only in certain circumstances. Nearly a third (29%) are happy to get basic answers from chatbots, but 77% want to chat with a human when they have more complex queries. Chat is coming of age, with 68% of people saying they’d use it instead of the telephone, email or social media, due to its real-time, conversational nature. Yet while nearly half (49%) of companies surveyed by Eptica claimed to offer chat, just 22% had it working when tested. Many brands seem to be switching it off when resources are tight, as well as failing to integrate it with other channels or centralised customer service knowledge bases, leading to a disjointed experience for consumers. To evaluate the real-world chat experience, Eptica tested 100 leading UK brands on their ability to respond to questions asked via the chat channel, measuring speed, accuracy, context, personalisation and empathy. Results demonstrated the positive benefits of chat – it took just 2 minutes 14 seconds on average to get a response to a query, with 82% of replies successfully answering the question asked. However, with just 22% of companies having chat working when tested, brands are missing out on this vital opportunity to engage with consumers. Consumers also value proactive chat, which offers help if they become stuck during a transaction. Nearly two thirds (64%) say they want brands to provide chat proactively, but only 46% feel they are offered it when they need it. 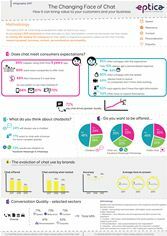 The Eptica 2017 UK Chat Study surveyed 1,000 consumers online on their attitudes to chat, as well as evaluating 100 leading UK brands. Research was carried out in September 2017. A full report, including the study results, graphics and best practice recommendations for brands to transform their chat operations is available at https://www.eptica.com/cfcuk.